Magento 1 vs Magento 2: Top 7 Reasons to Upgrade in year 2019! Even after the release of Magento 2, there are 420,000+ stores still running on Magento 1. It could be because of uncertainty, discomfort, or simply procrastination. To clear the clutter, let’s dive into a detailed analysis of Magento 1 vs Magento 2. 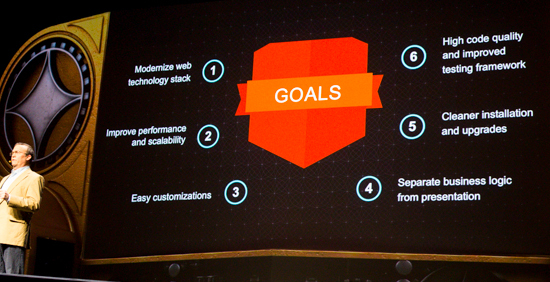 Magento 1 was launched in back in 2009. The release of Magento 2 after 10 years has taken into consideration a lot of factors like voice search, speed improvements, changes in buying behavior, AI, and more. Although there are still many gaps in Magento 2, I still think it’s THE time to move to Magento 2. The Magento team has extended Magento 1 support till June 2020. This means Magento will stop updating and releasing the latest patches, security, and extensions from their end. Whereas, Magento 2 has introduced advanced features like page builder, PWA integration, easily managing and automating codes. You can follow their release notes to keep yourself updated. The main issue with Magento 1 is store performance. 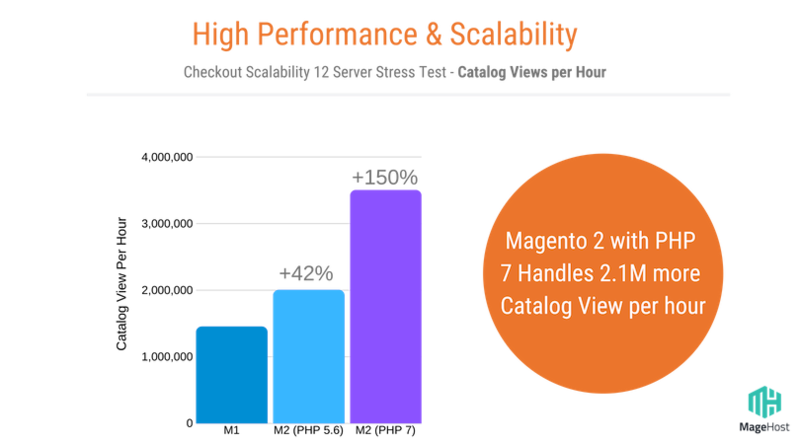 The Magento team has improved the Magento 2 architecture drastically. You will see an addition of newer technologies like the latest version of NGINX, Apache, Composer, Zend, and Symfony. 2.1. 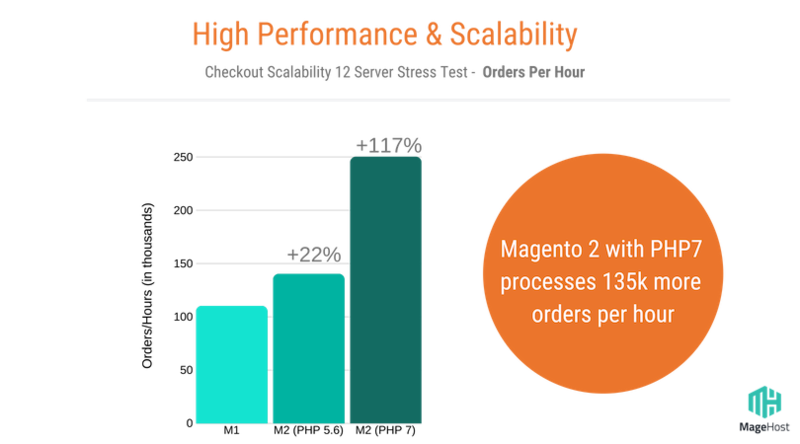 Magento 2 + Latest PHP: Together it has improved the store speed. You will see M2 is able to handle more orders than M1. 2.2. 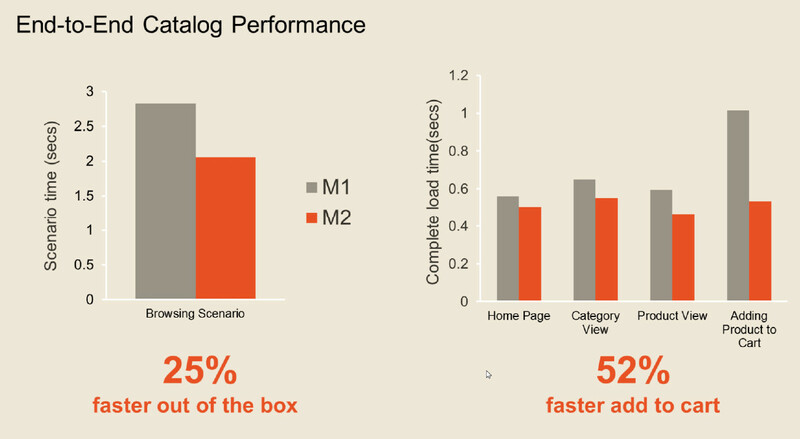 Better Browser Caching for Static Content: Most of the eCommerce stores are happy with Magento 2 performance. Their page load is under 3 seconds now. Thanks to Varnish cache and Full-Page caching. Community editions: of Magento 1 & 2 are free to download. Enterprise Edition: The cost of EE for Magento 1 & Magento 2 are different. The improved architecture in Magento 2 has given it a clear win over Magento 1. 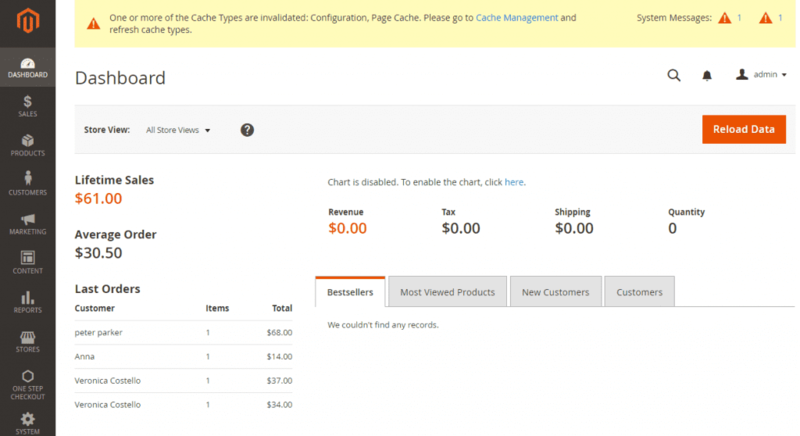 The admin panel in Magento 2 allows you to find information easily and you’re able to manage your store more efficiently. 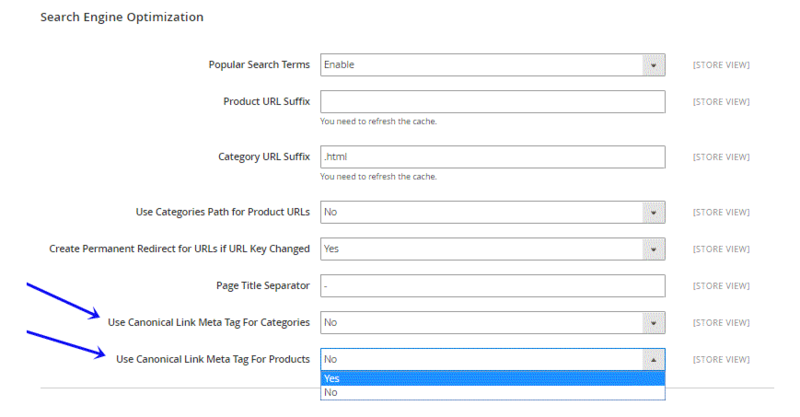 Magento 2 Admin Panel: As you can see, it offers information like lifetime sales, average orders, last orders, top search terms, revenue, tax, shipping, quantity, check bestsellers, and more. This will help you monitor your business progress. 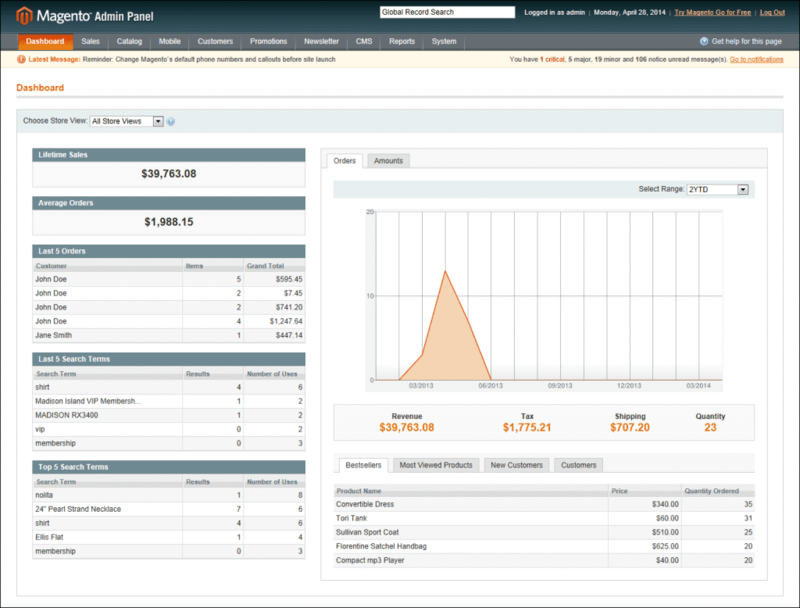 Magento 1 Dashboard: The panel is a bit cluttered when compared to M2. 1. Cleaner Codes in Magento 2: With so many 3rd party extensions for Magento 1, there was a problem of conflict. The extensions conflicted when two or more tried rewriting the same functionality. This costs time and money. Magento 2 has cleaner codes that allow extensions to overlap core code instead of overriding them. 2. Easier Installation: Installing & updating new extensions in Magento 2 has become easier and cheaper. Thanks to the new technology like HTML5, Require.js, and CSS3). Magento 2.0 has introduced Schema.org which is proving to boost the SEO of stores. Also, the rich snippets on the catalog pages are pushing up the ranks. Magento 1 support is going to end next year. It is important to migrate to Magento 2. The technology and innovation used in Magento 2 will make your store faster and more secure giving you a competitive edge! Most of the eCommerce websites are migrating from Magento 1 to Magento 2. Want smooth migration with zero to minimum downtime? Talk to our Magento experts!